"286 Table Rock Lower Falls, from below"
The photographer was probably set up on a large flat rock when he took this image from the riverbed below the Lower Falls. In the center is the north face of "Table Rock", to the left part of Sugar Loaf rock is visible. Between them one can make out the "V" of the Flume. 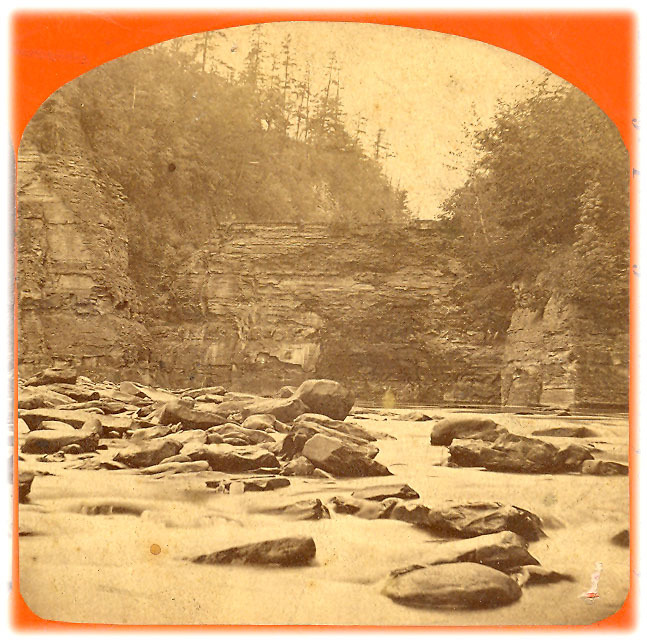 Long ago this was the location of the last of the three main Portage Falls, with the Genesee River tumbling over the edge of Table Rock to form a waterfall comparable to the Upper Falls in height. Eventually the river found a weakness in the bedrock and dug the channel along the east side of the gorge, leaving Table Rock high and dry. See a enlarged image below. Click here to see another view Table Rock, including the Lower Falls area during the Flood of 1972. Also see Hall's Sketch of the Lower Falls.